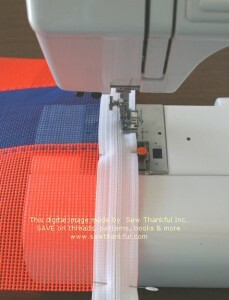 ©Tracy Chapman & SewThankful Inc. May 2009. All Rights Reserved. This pattern/project tutorial is intended for personal use of the home sewer who has their own personal access to this website. At this time, this project is being provided online only for a limited time as a free tutorial. There is no PDF available for this project. No part of this pattern/project may be reproduced for any distribution purposes whatsoever–whether by group, entity or individual. The pictures and written instructions are not to be copied for distribution, reproduced for distribution, repackaged for distribution, distributed, circulated, given away or sold in any form or fashion. If you wish to share this project with others, please provide them with a link directly to this page. 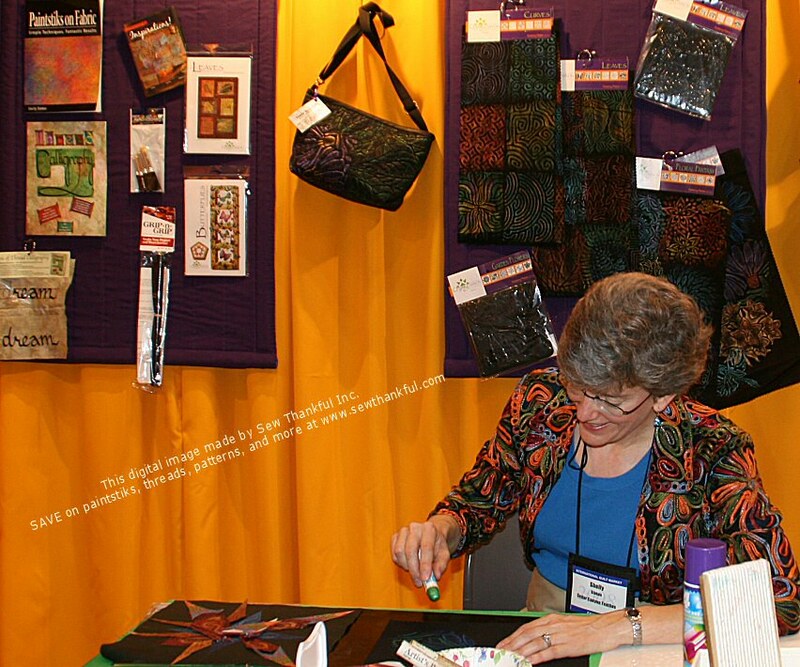 Permission is granted for individual home sewers/crafters to make and sell small quantities of the sewn/finished project. Each user assumes all risk and liability for use and end result of this project. 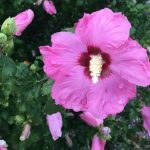 Tracy L. Chapman & SewThankful Inc. shall have no liability with respect to loss or damage caused directly or indirectly by the information contained in this project. 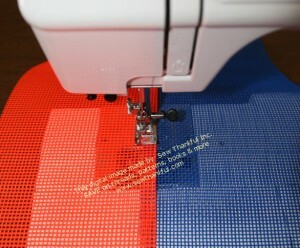 Please read all instructions completely before cutting any materials or beginning the project. 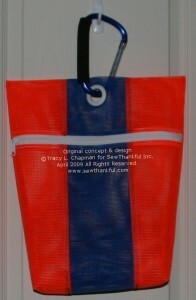 (1) size Medium Dritz Curtain Grommet (1″ Grommet) NOTE: 1 package of these grommets will make 8 bags. Sturdy Thread — coordinating and/or contrasting, as desired. 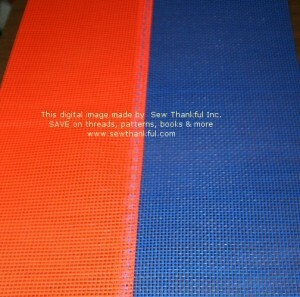 I like to use Superior So Fine Thread to sew vinyl mesh. Finger press and roll seam flat from front so that seam allowance will point away from center of bag. 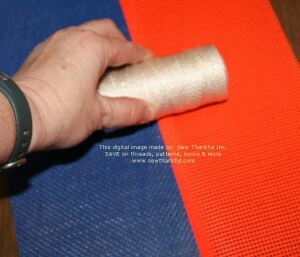 Hint - a soup can or a firm cylinder of almost anything works great to roll and flatten the seam. I used a roll of decorative string. 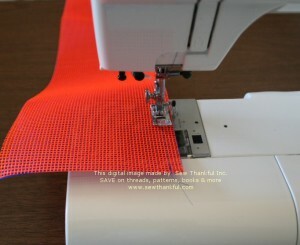 Run a 2nd top stitch line parallel to and approximately 1/4" from the first top stitching. Add optional zigzag or other decorative stitch between the top stitching lines -- this provides additional strength to the seams of the center panel and adds visual interest. Repeat process with the other strip of mesh to form your panel. 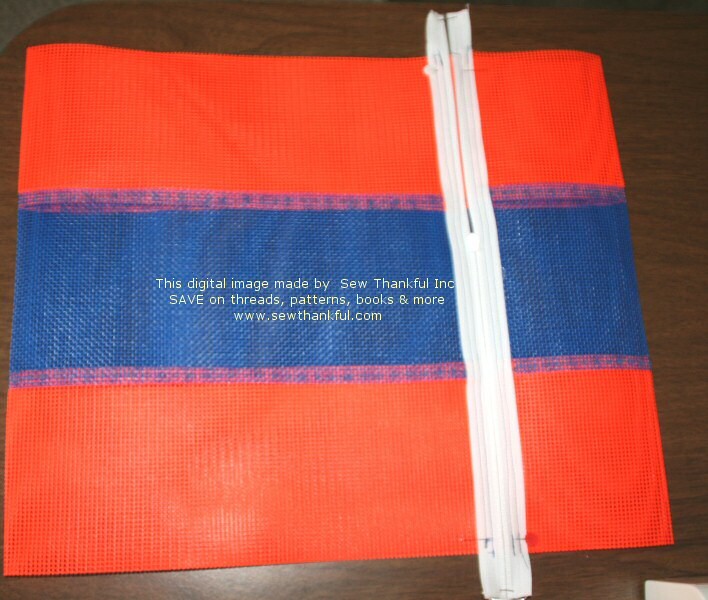 Trim panel if necessary to measure 15 1/2" x 36"
Measure and mark with chalk or other NON-permanent marker 4 1/2″ down from top edge on both sides of the bag, as shown in picture below. 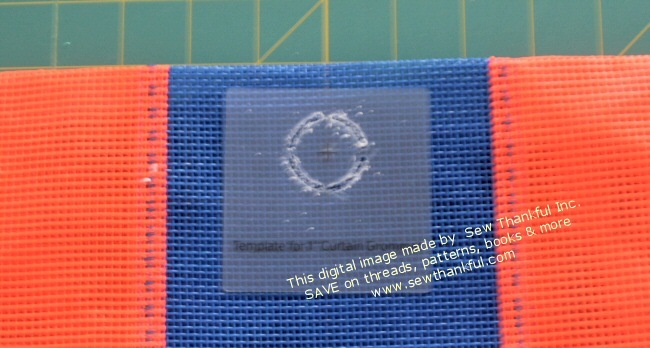 NOTE: These marks are where the bag will fold over to form the top edge of the finished bag. Use this information to determine which direction you prefer your zipper to zip — it’s your bag and the choice is yours. 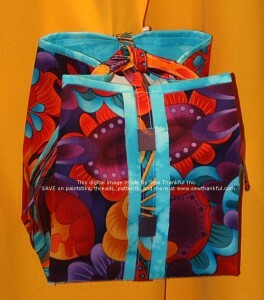 Determine preferred zipper orientation. 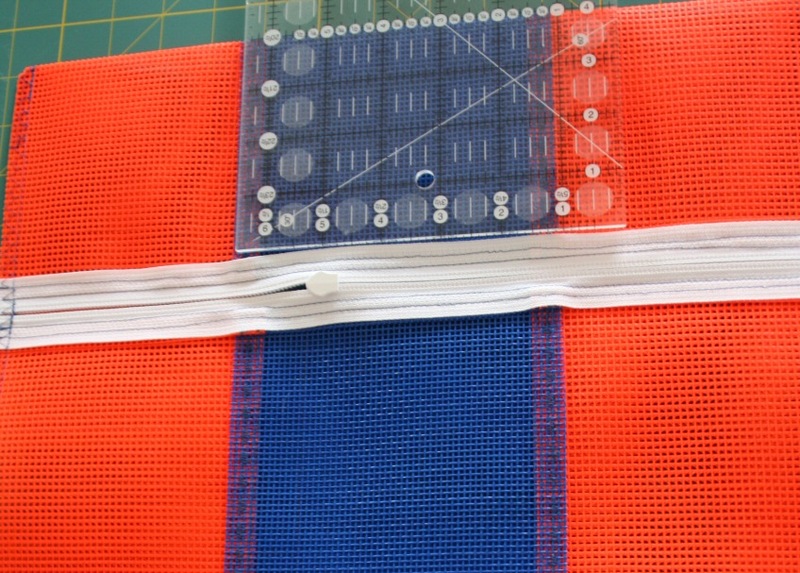 Pin zipper in place along edge of mesh as shown with approximately 1 1/2" of zipper tape extending beyond the edge of each side of mesh; right side of zipper facing right side of mesh/bag. If you have one, change your machine presser foot to a zipper foot. 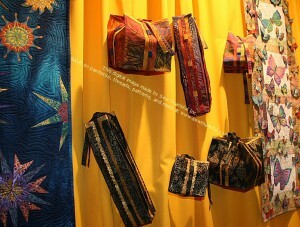 A zipper foot does make it easier but it is NOT necessary to put in a zipper. 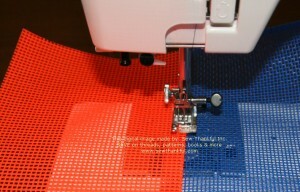 Make sure zipper pull is extended past the edge of mesh and out of the way of your presser foot. Sew first side of zipper on as shown. Un-pin safety pin from one side of top of zipper, close and leave in place on the other side of zipper. Carefully slide zipper back open. 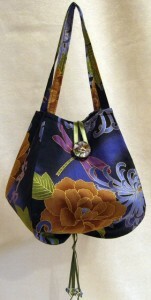 Finger press seam allowance toward bag (away from zipper). Top stitch approximately 1/4" from edge of zipper seam. 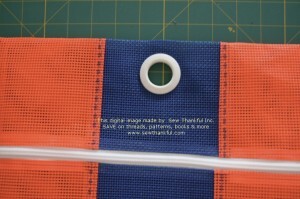 Re-secure safety pin to both sides of zipper tape and carefully pull zipper closed. 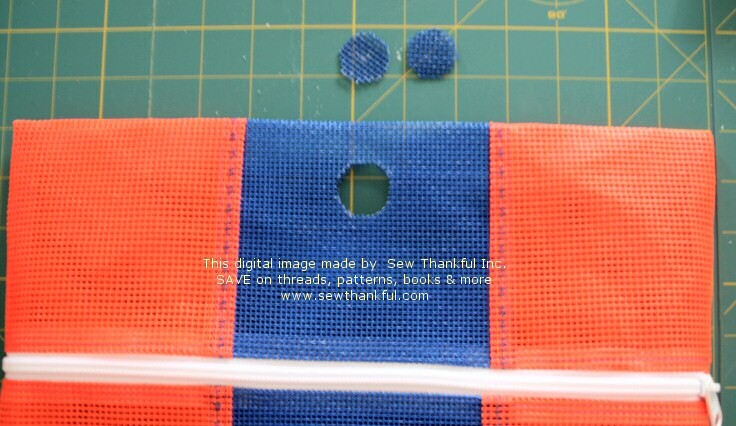 Pin other side of zipper to the other edge of vinyl mesh, right sides together. 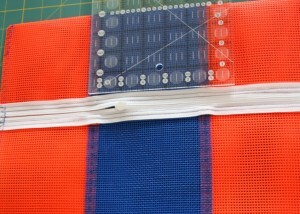 Align zipper tape with opposite edge of vinyl mesh, stitch as shown removing pins as you approach them. Un-pin safety pin from one side of top of zipper tape. 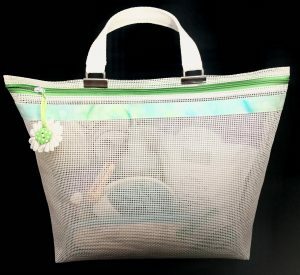 Move zipper pull backward, unzipping until you are past the edge of mesh, resting against the safety pin at the bottom of the zipper. 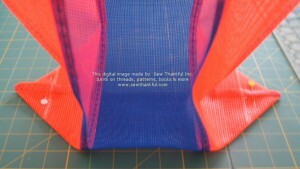 Finger press seam, pressing seam allowance away from the zipper, toward the bag. Topstich just like you did on the previous side. Re-secure safety pin at zipper top. 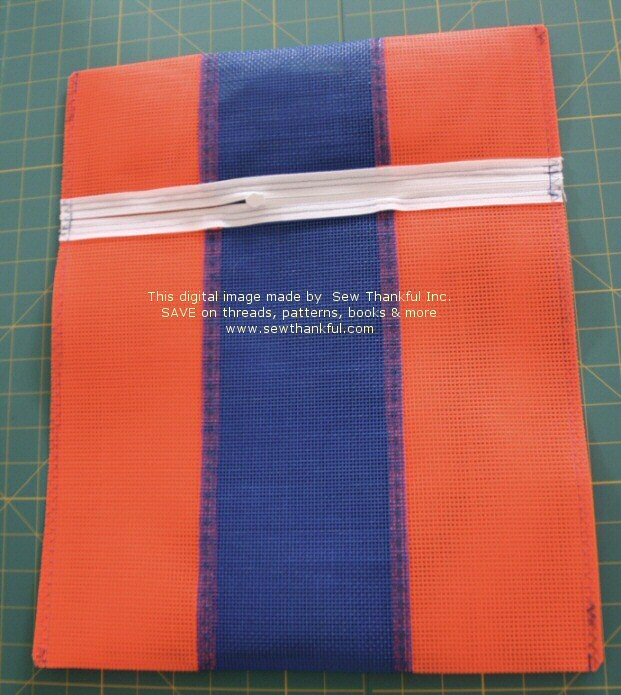 With bag right sides together (wrong side facing you), close the zipper only 1/2 way across the bag as shown. 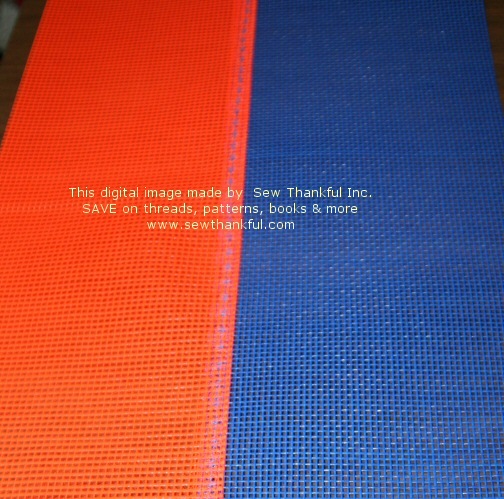 Find the chalk marks made previously (on each side, 4 1/2" from the mesh/zipper edge). Make a crease across these marks to form the bag top edge. 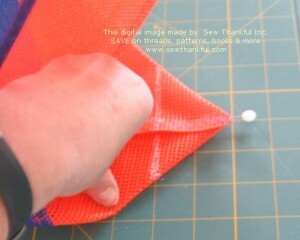 Flatten smoothly all the way down the bag and fold/crease at bottom as shown. 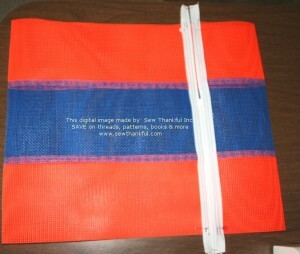 Pin sides of the bag through mesh and zipper ends to prevent slipping or shifting as shown above. 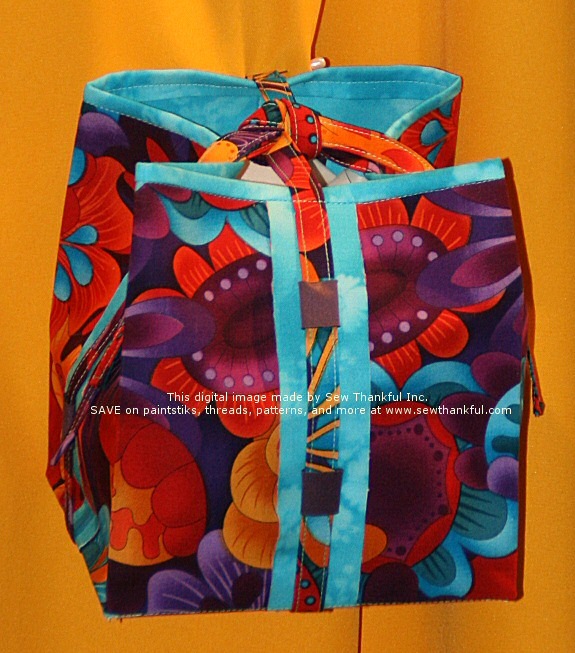 With bag inside out and pinned at zipper ends in seam allowance, make sure zipper is at least 6″ open. Use 1/2″ seam allowance. 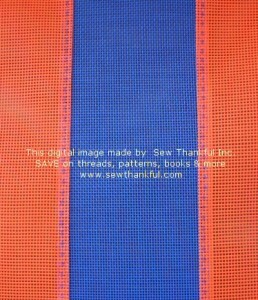 Back stitch at beginning and end of seams to secure. Stitch each side of the bag. 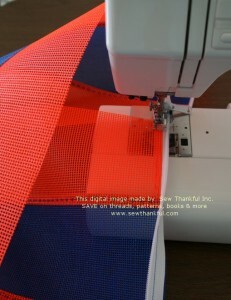 Use a wide zigzag to finish each side seam and provide additional security. Carefully clip corners (do not clip any stitching). Trim off ends of zipper tape. 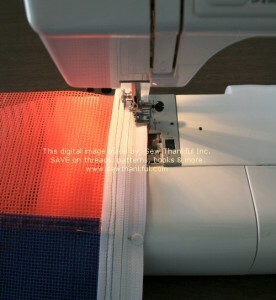 Pinch and press side seam into bottom crease until they line up perfectly. Flatten down as shown below. 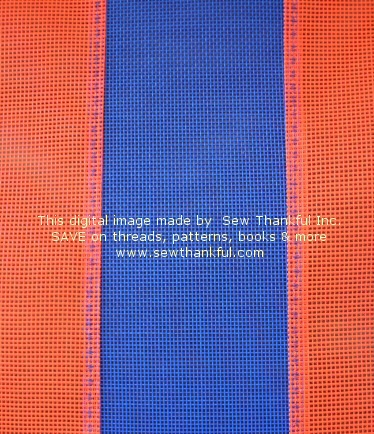 Mark a line 2" from the point of the side seam. Pin to secure. Repeat on other side/bottom of bag. Both sides of bag bottom marked and pinned. 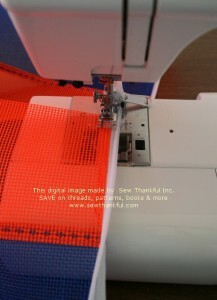 Backstitch to secure at beginning and ending — stitch across each marked line. Trim corners off to form 1/2″ edge. 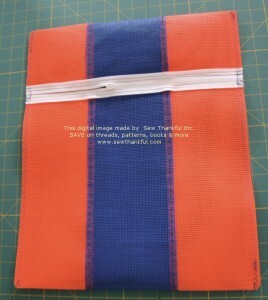 Zigzag to finish and secure each seam allowance. Reach in through zipper, turn bag right side out. Work corners gently with fingers until they are crisp & sharp looking. Smooth and flatten top of bag. Measure to center top of bag, mark center with a straight pin. 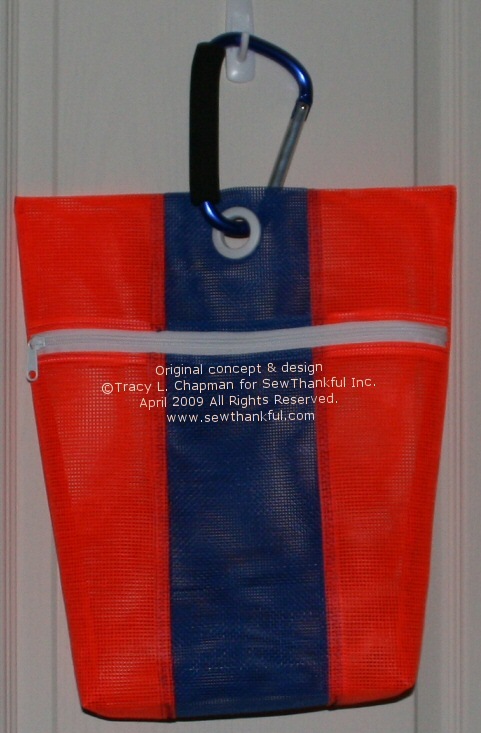 Take out one side of the grommet pieces and lay at center top of bag. Move it to the position you want it. I like the top edge of the grommet to be about an inch or so from the top edge of the bag. Once you determine where you want your grommet, mark the center of the grommet with a piece of marking chalk or other marker. 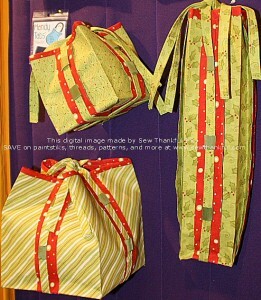 Follow grommet package instructions to apply grommet — it’s a SNAP! Line up template crosshairs with center chalk mark. Use marking chalk to mark the circle on the template stencil. Using your craft knife and downward pressure over a cutting mat, cut on the marked lines -- remember, you are cutting through 2 layers of vinyl mesh. Remove the cut outs. Test to see if grommet fits by placing raised center grommet piece into hole–you want a snug fit. If circle is not quite big enough for grommet to fit, trim carefully with craft scissors until you have it just right…you want a snug fit. The package directions are good, so be sure to keep and follow them. Then place grommet front and back and SNAP together firmly with your hand using downward pressure on a hard, flat surface. Now just snap on your jumbo carabiner and you are DONE! !